in iOS, a typical challenge is that ads do not stay docked properly to a certain position on the screen. This blog post outlines a simple solution to this common problem. 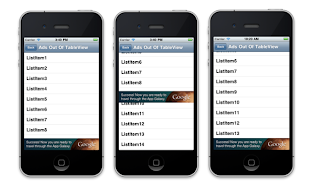 Consider a simple application in which a UITableViewController is used to handle a list mechanism. If this is the main top level view in the application, getting the ad to remain docked to the bottom or top of the view while the content scrolls is problematic. This is usually because the ad has been placed inside the Table View. As shown in this example, the GADBannerView is initialized with a frame that has an origin at the bottom of the screen. Now when the ad is received, it should be added into the container view, and the size of the Table View should be modified accordingly. The height of the Table View's frame cannot be modified directly, but this can be done using an intermediate frame as shown below. Now, no matter how much the Table View is scrolled, the GADBannerView stays docked to the bottom of the screen. 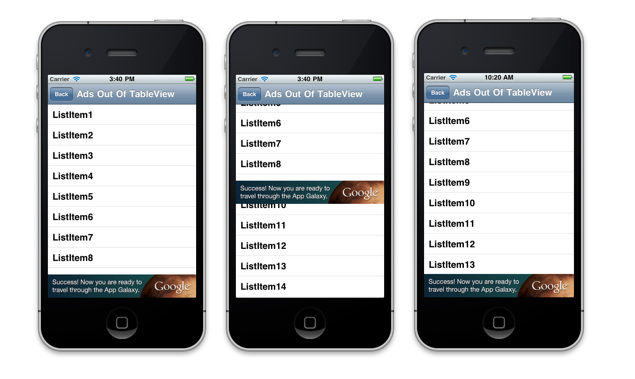 With those minor tweaks, you will have ads set up correctly alongside your Table View! If you have any questions about this or any other SDK topics, feel free to post them in our forum. Perfecting the look of your application is challenging, and incorporating ads into your application requires careful thinking. When using the AdMob SDK with Table Views in iOS, a typical challenge is that ads do not stay docked properly to a certain position on the screen. This blog post outlines a simple solution to this common problem.